Whether you’re installing your own flooring or you’ve decided to partner with a professional flooring installer, a flooring installation can be a big project. Whether you’re installing your own flooring or you’ve decided to partner with a professional flooring installer, a flooring installation can be a big project. It requires a certain amount of preparation. Doing a few things to get your home, and your family, ready for installation time can do a lot to help the project go smoother, no matter how much flooring is being installed. Here are a few things you can do to get ready. 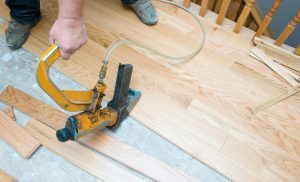 There are several steps involved in a flooring installation. Talk to your installer and make sure you know what services they will perform. Will they clear the area? What about the old flooring? Will you need to rent a dumpster? Make sure you know all of the details so you know what to expect once the installation begins. Whether the installation is in one room or an entire level of your home, you will need to make sure your things are not in the way. Furniture, appliances, and everything in closets could potentially be covered in the dust that is involved in a flooring installation. If you have the space available, just move these things elsewhere in your home. If not, you can always just rent a mobile storage unit and the company can just park it in your driveway. Your pets are going to be curious about all of the new people in their home. They may even be frightened or defensive. Your best bet for your pets may be to ask a friend or relative to care for them during your flooring installation. If no one is available, you can board them. Also, you should consider what your installation team will need. Be sure there will be someone at home to let them in, or have a key made so they can come and go as needed. Show them to a restroom they can use, where your circuit breaker is, and where your outlets are. If you have any special rules in your home, make sure those are clearly known as well. This entry was posted on Friday, October 27th, 2017 at 3:18 pm. Both comments and pings are currently closed.